There is no part of Roger Dubuis that doesn’t exude an extrovert’s confidence. Their SIHH presentations always reinforce this message, and what has come from them so far in 2017 shows that they are not in any danger of changing their course away from incredibly bold and vibrant timepieces. Today we focus on a new Quatuor. The Excalibur Quatuor was first introduced in 2013. What was special about it was that it was the world’s first watch incorporating four sprung balances and five differentials. Since then it has come in a number of versions such as DLCd titanium and red gold, but 2017 brings on the Quatuor Cobalt MicroMelt®, in a cobalt-chrome alloy. This new alloy has a patented process which Roger Dubuis have called ‘Micro Melt”, whereby the alloy is melted and refined in a furnace under ‘vacuum’ conditions after which it is forced through a stream of high-pressure inert gas which ‘shatters’ it into a fine powder that is then sorted and blended then poured into canisters, after which it is subjected to hot isotatic pressing, which is a means by a material’s porosity and density is increased in order to make it more easily worked with; in this case, to turn into a watch case. A very hard watch case and a very non-corrosive one. 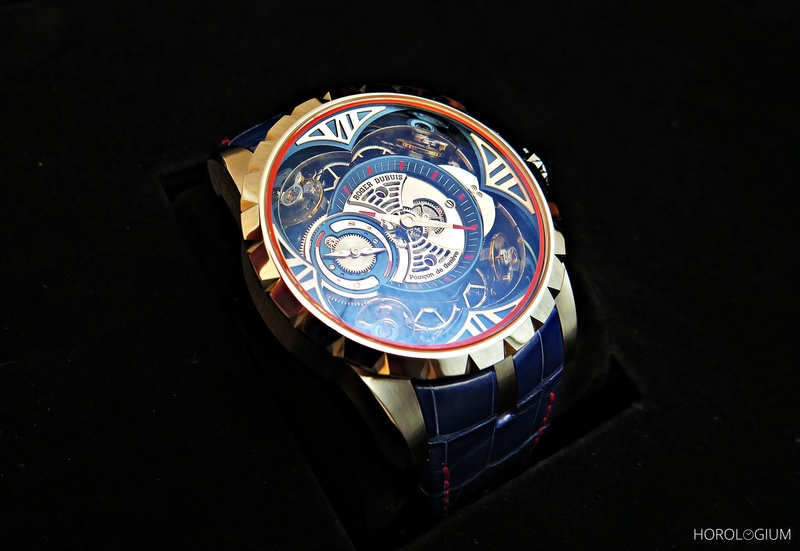 Roger Dubuis have become known for using techniques not normally seen for watch cases. As they’ve gone to all the effort of doing this, and protected their intellectual property, I am guessing that we will see it appear in future pieces. Of course, it being Dubuis, we can’t forget about the skeletonised movement. It’s the manual-wind Calibre. RD101, first seen in 2013 and visible here through an open case back. The Calibre RD 101 consists of four sprung balances each placed at a different ‘corner’ (insomuch as a round thing can have corners) of the dial. The sprung balances help to compensate for timing errors associated with the watch’s position and they also oscillate at 16Hz instead of the more common 4Hz. It’s not just the 48mm case that is Cobalt Chrome but also the bezel, case back and crown. The case is 18.38mm thick. On the dial side it is PVD-coated with a red and white printed minute track, blue PVD coated flange, rhodium-plated indices, and white gold hands that are tipped in red. Because it’s so easy to get distracted by the sprung balances, it’s almost easy to miss that there is a power reserve indicator at 9 o’clock. The new Quatuor Cobalt MicroMelt® comes on a blue alligator strap with red stitching that has a Grade 5 titanium folding clasp. This is a crazy watch with a typically bold Dubuis colourway. Of the Dubuis releases that we saw this was probably the one that I was most intrigued by, but in a limited edition of eight with a rather hefty feel and 390,000 CHF price tag, it is probably not for everyone.